If I’d known these three things before I married, I would’ve been much better prepared. When I was single, I regularly asked my married friends to share their advice on what it took to have a happy marriage. Almost every response was a variation of the same, foreboding theme: “Just remember this: Marriage is hard work.” That was it — no further explanation. My friends made marriage sound so depressing, and I regularly went on rants about how their input annoyed me. I was looking to these people for inspiration, and it sounded like they were trying to talk me out of getting married. Now that I’ve been married for five years, those conversations don’t seem so off-putting, because I finally understand why my friends felt compelled to rain on my parade: They knew me. They knew I was idealizing marriage, and they knew I was headed for major disappointment if I didn’t figure out that marriage was going to challenge me in ways I wasn’t prepared for. But anyway, I wasn’t listening to them. I was listening to my imagination, and it was telling me that I was different. I wasn’t going to have to learn the hard way, because I had what it took to be a good husband from the get-go. 1. You are hard to live with. I hate to break it to you, but you’re actually very hard to live with, and the reason you’re so unaware of it is because you’ve lived by yourself for most of your single life. So the only person you have to get along with is you. That’s easy. You occasionally bump into difficult personalities, and you assume it has everything to do with them and nothing to do with you. If you actually lived with other people, you might begin to see that difficult relationships can’t always be the other person’s fault. It might have something to do with the fact that you’re both insensitive to the needs of those around you, and you’re hypersensitive to people who challenge you. Here’s how that looks in your everyday life: You insist on having your way far more than you realize; you distance yourself from those who don’t appreciate you; and you take your 25-year-old opinions far more seriously than they ever deserved. Well, I’ve got news for you: That lovely wife you’ve been daydreaming about isn’t going to let you get away with this. She’s going to be a strong, self-respecting woman, and she’s going to share some of the feedback you’ve been missing out on while living alone. You will accuse her of being hyper-critical, rebuke her for being disrespectful, and resent her for noticing the truth. And for a while, that will successfully insulate you from the positive effects of her feedback. The good news is that eventually, you’re going to turn a corner. In your first year of marriage, you’ll have the good sense to make friends with married mentors, talk to them frankly about your marriage, and ask for their feedback. And when those men tell you the painful truth that you’ve been hearing from your wife, you’ll feel shame at first. But with their support and your wife’s love, you’re actually going to begin the life-long process of embracing humility. 2. You’re kind of a chauvinist. 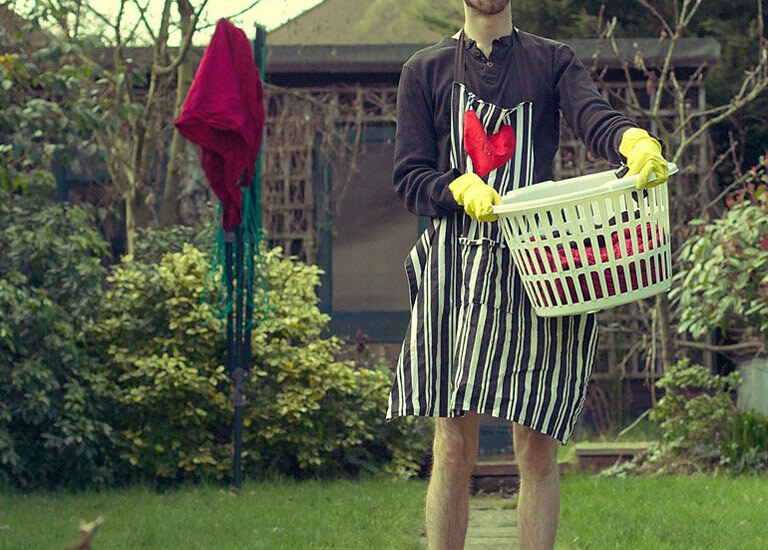 Let’s be frank: You think you’re above chores. You grew up around a saintly mother who did a lot of the household work without much help from you, and you felt proud of yourself if you even mowed the yard. After several years of living in an apartment, you don’t even have to mow. And when it comes to domestic housework, you leave dishes in the sink, you don’t sweep the floor, you don’t make your bed, and the toilet, oh, my goodness — anyway, let’s just stop there. Your laziness alone will cause a great deal of strife in your marriage. But what will really cause friction is what’s behind your laziness: that is, you don’t like to do woman’s work. Like, you’re sort of a chauvinist. Go on, admit it — you wouldn’t mind at all if your wife spent an hour cooking a good meal and then let you read a book while she did the dishes. And the reason you wouldn’t mind is because you associate sinks, mops, brooms, and vacuum cleaners with women. Brother, listen to me: That is a problem, and it’s not just a problem because it belittles women. It’s a problem because it speaks volumes about the fact that deep down inside, you see your wife as your servant. But don’t worry — she’s going to pick up on that very quickly and insist that you treat her like an equal partner, not an employee. Unfortunately, you will resist mightily. Back and forth the two of you will go until, one day, about two years into marriage, you’ll have a sponge in your hand, scrubbing the gristle out of the frying pan, and you’ll realize you’re doing it because it’s your job. It will also eventually occur to you that it’s not fair for you to work from a cozy office 45 hours a week, come home to a good meal, and then expect her to clean up everything after having a couple of toddlers hanging on her all day long. The next thing you know, you’ll find yourself voluntarily sweeping multiple times a week and taking out the trash before it’s falling out of the can. That is, you’ll finally begin to see that you and your wife are there to serve each other until the job is done. And wonder of wonders, when that day comes, marriage will get easier, and you’ll discover that it’s actually a big turn-on when you’re helpful around the house. 3. You’re marrying a broken woman. The single greatest thing that will make marriage hard work for you is letting go of your expectations of your wife. You’ve got a laundry list of qualities you want in her and — good news — she’s actually going to have many of those qualities. But she’s also going to bring faults and character issues to the marriage, and dealing with those will test the limits of your patience. We don’t need to get into the specifics of what those flaws will be, because it doesn’t matter. What matters is that you understand that you are far more broken than you realize, and you’re going to marry a woman who’s far more broken than she realizes. I’m not going to lie: You’ll struggle from the get-go and wonder why marriage is so hard, but the good news is that there will be more to your marriage than struggling. You’ll travel together, pray for each other, comfort one another in sorrow, and make each other laugh. So don’t worry: You will like each other, despite your frustrations with each other. And as for those frustrations, there’s even better news: You’ll both start taking them to Jesus, but He won’t let you get away with finger pointing. He’ll take those frustrations and use them to reveal the impatience, the pride, and the unforgiveness in your own hearts. It won’t be pretty at first, but over time, you’ll begin to see that you’re the answer to each other’s prayers. And I’m not talking about your repeated prayers for a spouse. I’m talking about those times you asked the Lord to help you grow spiritually.